“It’s kind of a shock for me. 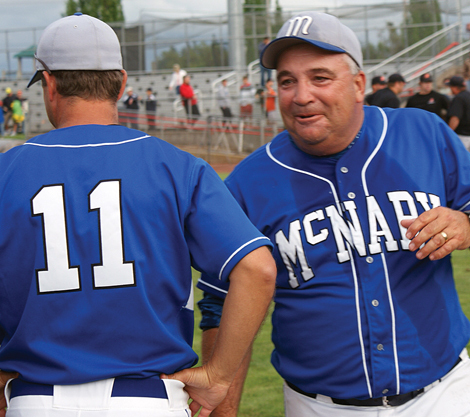 It’s kind of a shock for everyone I’ve told so far,” said Craig Nicholas as he explained how his inner circle reacted when he told them he was stepping down as head coach of the McNary baseball program. Nicholas’s coaching career spans 28 years. He joined former McNary coach Vic Backlund’s staff as junior varsity coach in 1985. He became the Celts’ head coach in 1999 when Backlund won a seat in the state legislature. Nicholas was a part of all three of the school’s state championship teams. He was an assistant on the 1989 and 1992 teams and head coach of the 2009 team. Nicholas based his decision on the desire to spend more time with family coupled with a change in perspective. Backlund noticed the change in his long-time friend. The end comes a few weeks after the defending state champions fell 1-0 to Reynolds in the opening round of the OSAA Class 6A state playoffs. Nicholas actually considered resigning last year after McNary won its third state title against Roseburg. But he felt he owed one more year to returning seniors Zach Moeller and Sean Curry. No successor has been named, though Nicholas’s staff remains intact, with the exception of assistant coach Chad Booth. “I love the program to its very core and will miss being around it more than words can describe,” said Booth, who also played for Nicholas. Booth played for the McNary varsity in 1998 and 1999 (Nicholas’s first year as head coach). He also played for Nicholas on junior varsity and American Legion teams. The 1999 McNary team reached the state title game, but lost. Booth, who joined the McNary coaching staff in 2004 after his college playing days ended, said his mentor will be a difficult act to follow. Nicholas could also rally the community around a cause, as in his drive to improve and beautify Vic Backlund field. Recent improvements have been made to the backstop, field and bleachers thanks mainly to volunteers. “I think about high school facilities in the state of Oregon. North Eugene, by far, has the best baseball facility, there’s nothing close to it. Roseburg’s is unbelievable. And after that, there’s us,” said Nicholas. No other sports program at McNary has won more state titles than baseball. “The stability of the baseball program’s leadership has been one of the main reasons that McNary baseball has been so successful,” said Backlund. Backlund coached McNary from 1966 to 1975 and from 1979 to 1998, Mike Jesperson from 1976-78, and Nicholas from 1999-2010. A long-time defensive coordinator for Celts football, Nicholas left the team in 2009 when former McNary coach Tom Smythe offered him a similar position at Lakeridge. He gave Smythe a two-year commitment and will return in 2010. The Renaissance Inn opened a new restaurant last month. and a stint as executive sous chef at the Sands Regency Hotel. He plans to offer daily specials, which recently have included chicken marsala, bourbon-glazed chicken and prime rib. Everyday menu items include wild Pacific salmon, a 12-ounce New York strip steak, 12-ounce ribeye with an optional honey green pepeprcorn sauce, pan roasted pork tenderloin, scallops, chicken and all manner of pastas. House-made soups are always on the menu, and all the steaks are certified Angus beef, he said. The restaurant is one of only a handful in the area with that designation, he said. Bailey plans to order as much as possible from northwest suppliers, providing Tillamook cheese, Black Butte porter for the potato soup, wild-caught Pacific Northwest salmon, and almost anything else local he can get his hands on. The wine list also has many Oregon wines, he said. Manager Teresa Ridderbusch described how the new place is different than the Wall Street Grill, which preceded it in the hotel’s lounge. Besides, she said with a laugh, Wall Street (the one in New York City, not the restaurant), hasn’t been exactly making friends lately. Yet she and Bailey believe the new place will catch on as people learn of it. The city of Keizer and urban renewal budgets will be up for approval at the Monday, June 7 Keizer City Council meeting. A combination of utility rate and fee increases, along with pay freezes for non-represented employees, will help to balance this year’s budget without layoffs or furloughs. Ongoing cuts to police overtime, along with travel and training, are helping to fill gaps created by lower-than-expected revenues, along with cuts to the Keizer Community Library, parks and public art. A proposed water rate increase was shot down at the Budget Committee, but new fees and increased rates will add about $26 per year to the average household utility bill, city officials said. The increases will be part of a package that adds a stormwater license fee, and increases stormwater rates and the sewer license fee. Police – who had been slated for a layoff – won’t see a position cut, but they are taking steps to cut back spending. The department is cutting back its Community Response Unit – which targets areas with chronic problems, particularly drug sales – reducing the unit from four officers to two. Police Chief Marc Adams also said the department is removing an officer from the Drug Enforcement Agency Task Force. The state of Oregon is facing another budget crisis. This week state economist Tom Potiowsky released an economic forecast that reports tax collections coming in half a billion dollars less than expected. Gov. Ted Kulongoski immediately called for state agencies to cut their department budgets by nine percent. Some are calling for a special legislative session to address the shortfall. Others say that a special session would quickly devolve into a partisan screaming match. And all this in an election year when few candidates want to go on the record with specific ideas or goals. The residents of Oregon have been buffeted enough by both sides on spending issues. The time is long past for leadership and it doesn’t matter where it comes from: the governor or the legislature. It is said that elections have consequences. That is very true in Oregon today. One party is in control after years of being in the legislative minority. It is human nature to throw open the cupboard to reward your friends and allies; every victorious politicial party does it. To the victor go the spoils. In an economic climate that features millons and milllions of dollars worth of budget cuts that affect real people throughout the state, there aren’t many spoils to go around. And yet the victors still want their booty. Until the state of Oregon can pull itself out of its recession, create new jobs and stabilize revenue sources, we will be facing these budget shortfall situations for years to come. The public will be shocked when economists cite lower-than-expected revenues; state employees will decry that the burden of balancing of the budget lands on their shoulders; social service groups will demand that no cuts be made in their field. Further cuts in education budgets comes at the same time as we find out that less than 70 percent of our high school students graduate on time or at all. It has been said that every problem has been solved—somewhere. We can find solutions to Oregon’s budget and revenue problems, if we look elsewhere. Oregon needs the political will and the political leadership to lead the state out of this budgetary wilderness and set us on the right and fair path again. We can only hope that rather than giving either side a mandate, voters in the general election will send a clear message—don’t spoil your victory by grabbing more than your share. Oregon has a spending problem. Not a revenue problem. At no time in recent memory has this point been made more clear than on last Tuesday, when the state’s economist told surprised politicians that the 2009-2011 state of Oregon budget had a $562 million dollar hole in it. To be more clear, that means that Oregon is going to take in $562 million less than originally thought. Again, to be clear, the legislature and the governor has already budgeted (and in some cases already spent) the $562 million that they found out Tuesday they are not going to get. And to make matters worse, the budget for the 2011-2013 cycle – again according to the state economist – is already $2.7 billion in the hole! Something has to give, either the state has to stop spending beyond its means, or we should all start endorsing our paychecks over to the state of Oregon. There is actually a reasonable, common sense solution to this problem. It is not the quickest solution, but it is the correct path for the state of Oregon to take in order to restore fiscal responsibility. It can be summed up in three words: private sector jobs. The logic is equally simple: the more private sector jobs we have, the more taxpayers there are. The more taxpayers, the more tax revenue. Also, the more people who are working, the less people who are on public assistance, which means less need for more government spending. It really is not rocket science. The problem is the Oregon legislature and the current governor (and the current governor’s predecessor who wants to make the current governor his predecessor) have been openly hostile to private enterprise. Instead of passing (or repealing) laws in order to get out of the way of economic growth, current leaders in Salem focus on how best to regulate and strangle investment, free enterprise, and prosperity. Oregon should be leading the way out of the recession, but instead – again, according to the state economist – Oregon is actually lagging well behind the rest of the country in terms of economic recovery. I know our revenues are down, but the state’s next leaders need to do everything in their power to encourage investment and economic development in Oregon, and yes that means cutting Oregon’s outrageously high capital gains tax rates, among other things. For instance, the expense and delay in getting a building permit makes it cost prohibitive to site a factory in Oregon. The legislature should change Oregon’s laws in order to make it easier for businesses to locate in Oregon by removing these impediments. These are just two solutions that will open Oregon for business. Oregon is a state located on the Pacific Rim, with two deep water ports, and a plethora of natural resources which should make Oregon the envy of the rest of the nation. Instead, Oregon lags behind the rest of the nation because Oregon’s current leaders are unwilling to help Oregon realize her true potential. Ross Day lives in Keizer. He is executive director and general counsel for Common Sense Oregon. Confident that I speak for many members of the Keizer community, I would like to submit quick note of gratitude to the Keizer Police Department. It’s my opinion that this town has undergone numerous changes in the 16 years that I’ve been a resident, and that while it has blossomed into a more contemporary, less rustic locale, not all of those changes have been positive. Despite this, however, I feel safe on Keizer streets at all times at any hour, thanks to the officers who patrol them. Not only do the Keizer Police keep our homes, streets, and entire community safe, they’re also friendly and helpful. The officers are, for example, to a large extent responsible for the annual Iris Parade’s success and organization. They additionally do presentations and extra activities for school children, and keep those schools’ hallways and playgrounds safe for our kids to enjoy without concern for their safety. Having worked with Dan Kelley, for example, I had the opportunity, for many years, to observe his daily professionalism, warmth, and caring for McNary school kids and staff. Even the crankiest students, subsequent to receiving a traffic citation, likely recognize and appreciate Keizer PD officers’ putting their lives on the line on their behalf. The demands on police are steadily increasing, while funding is being diminished. Officers’ discretion in split-second judgment calls is regularly criticized, while their options in dealing with people who operate under no system of rules is becoming increasingly restricted. An appreciative thank you to the men and women of the Keizer Police, who are keeping our “big, small town” safe and friendly. Megan Hingston went three for three in her events at last weekend’s state track and field championships for Class 6A schools. The McNary senior, who qualified for the shot put and both hurdles, placed eighth or higher in each event. Hingston was second in the shot put (40-11), fifth in the 300m hurdles (45.77) and eighth in the 100m hurdles (15.92). The second place finish is a personal best for Hingston. During her freshman year, she was second in the high jump at the state meet as well. Hingston, however, wasn’t alone when it came to McNary athletes standing on the podium. Two other Lady Celts reached the finals of their respective events. Senior Lauren Brouse was eighth in the 400m (1:00.14) while junior Jenna Quesnel was eighth in the pole vault (10-0). Junior Tim McDowell represented the boys team with a sixth-place effort in the high jump. He cleared 6-2. The other members of the Lady Celts contingent included Brouse in the 200m, senior Rachel Fast in the 100m and senior Amy Jones in the 800m. Also not reaching the finals were the 4X100 and 4X400 relay teams. Members of the 4×100 relay included Brouse, Jones, Fast and sophomore Averi Wing. On the 4X400 were Brouse, Jones, Wing and freshman Laura Donaldson. McDowell did not advance beyond the preliminaries in the 400m, nor did sophomore Dylan McHugh in the 800m.